I have been not performing, blog-wise, up to the standards I set for myself this summer. If I had met those standards, two topics would have been set before you already and the third would have been pulled together for today. The problem, as often happens, is just when I gather my thoughts and my photo illustrations, I notice something in one of the paintings that I must, MUST fix. Then after the fix, a new photo must be taken. It has been a summer of revisions and regrets. One topic was to have been: best and worst plein air (marine) painting of the summer, covering why I thought one was good and the other not–but wondering how I could have rescued the one that was awful. A second topic was to have been the rest of the works resulting from the Stuart Ober course–you’ve seen the portrait of Sparkle, but I did a bunch of other stuff that never would have got started but for the impetus of taking a course called “Explorations in Oil Painting.” One of them could have been a topic in itself, as I worked on a 12 by 36 of “Impressions of Manhattan from the Whitney Museum”, a complex skyline with streetscapes that can always be improved or added to. I’m still adding. This week, I hoped to be posting all the Figure in the Garden paintings from David Curtis’ garden, 2016 edition. Those paintings are finished, but the last one still needs to be photographed. I scaled up to 16×20, making the photographing more challenging. I am going to take the advice I always gave my tax delinquent clients: do current returns first, then the past-due ones. Therefore, today without further ado, without messing about, I am posting photos of the three plein air paintings from the last two days, showing what I can accomplish in the approximately two hours available for each, before stopped by lunch and/or rain. Raw footage, as it were. Excuse me while I go snap photos of each one with my iPhone. 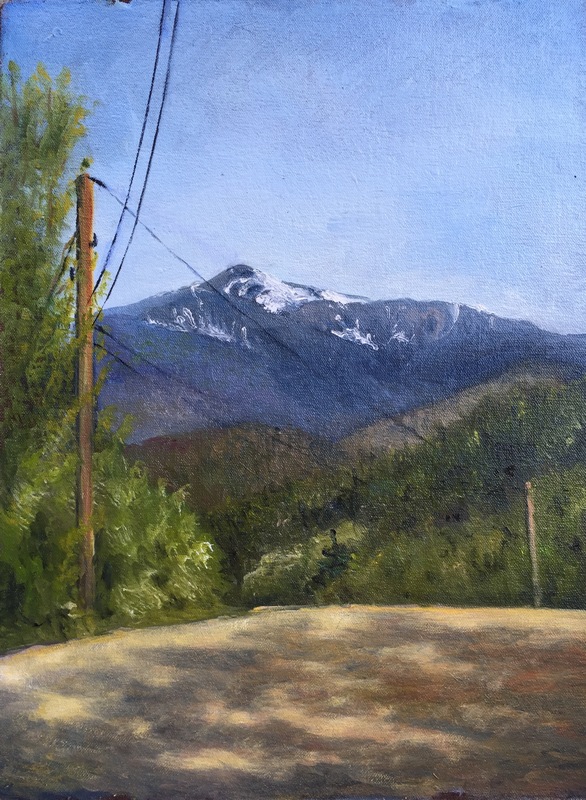 Eight students gathered at the Bartlett Inn in Bartlett NH to learn plein air painting from Michael Chesley Johnson, of Campobello and Sedona, for perhaps the shortest workshop ever–two days. We were lucky with the weather, in that the rain held off Tuesday afternoon and Wednesday morning until I was able to get one painting each time close to completion. I produced a third painting during the Wednesday rain. . .storm is too strong a word. Rain Event. More of that later. Tuesday morning MCJ opened with a demo of how to paint rocks. We piled into a gazebo near the Jackson Historical Museum– it was shaded, just the right size for 8 students and a teacher, next to a rock-filled Wildcat River, and near our next stop: a preview of the museum’s upcoming show. Then lunch at a local deli, then back to the Wildcat, a river responsible for the phenomenon known as Jackson Falls. We got some sun, but mostly clouds, so we got experience with painting en plein air on overcast days. How to find a “hook” when there are no lights and shadows to create drama? Well, falling water is always interesting. Unfortunately, New Hampshire has been suffering a record drought, so instead of impressive, thundering cataracts of water, we got meandering trickles. Day Two, or Wednesday as most people know it, we headed down into the Valley to experience the location of Albert Bierstadt’s “Moat Mountain, Intervale, New Hampshire”. That is why I have titled this painting Bierstadt Meadow. Most of us chose to paint the ledges that are to the right of my scene, but I’ve a bee in my bonnet all summer about the pinky-purplish grass that shows up at this time of summer. It is most prevalent along highways. It was not present in this meadow, but there were other plants sporting colors in the same family, so I thought I would try to fake it. We were treated to very little sunlight, but the weather forecast did not include rain. Nevertheless, Sharon (Sharon Allen, who organized this workshop and spends half her life painting around Mt. 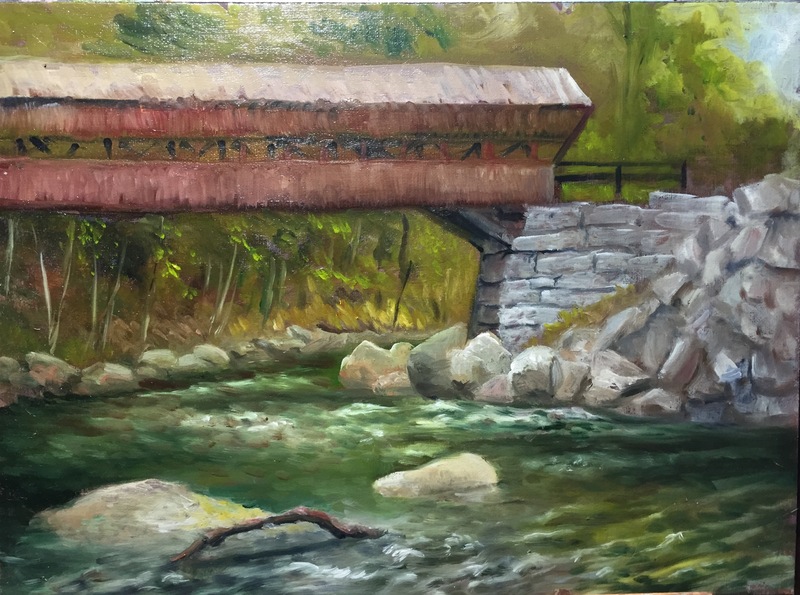 Washington Valley) “felt” it would rain and urged us to move to a sheltered location–under a bridge in Conway from which we could paint a red covered bridge from below and to the side. When we got there, most of the river (Swift and Saco merge near here) was, well, absent. We were going to get more practice painting rocks. 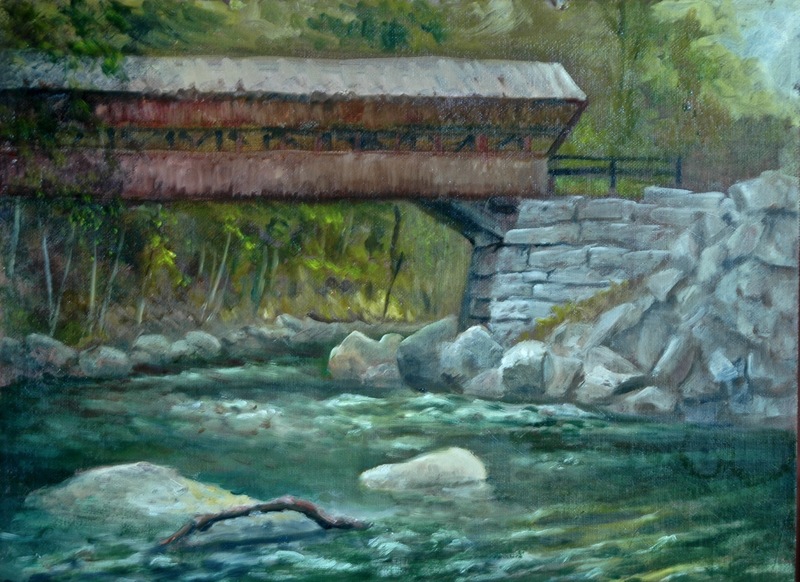 However, a puddle under the bridge reflected the red covered bridge, and I chose to make that the subject of my painting. All of my paintings were painted on the carton paper sold by Judson’s plein air supplier. The paper slows me down a little because it absorbs paint, making it harder for me to cover the surface. But once my surface is juicy with paint, I can go to town. The geometric shape on the right is the stanchion [is that correct term?] of the overhead bridge. When the rain blew in [is Sharon a witch? ], it disturbed the puddle and handicapped me. Oh, well. Had to fake it. Since I probably will not get to the topic, best and worst marine painting, and I cannot NOT show you the best, I will now show the best. Two “tall ships” came to the Portsmouth area. August 12 was the day I chose to visit them. One docked in Portsmouth for people to tour. The other docked in New Castle for people to ride. I would have bought a ticket to ride if my timing were better, but as it was, I had to wait for the “Harvey Gamache” to return to port before I could grab a photo of it. Meanwhile, I painted its expected path from New Castle’s Grand Island Park. In my studio at home, I added the sailing ship using my photo as reference. I have some happy news: two of my pet paintings will be part of a nationally juried exhibit in a museum! The museum is the Annmarie Sculpture Garden and Arts Center in a place called Solomons, Maryland. The Sculpture Garden is affiliated with the Smithsonian! The two honored paintings are “Sparkle”, which had been sold but the owners have agreed to lend the painting for this exhibit; and “Partners in Crime”–the two tuxedo cats on a cat tree. The exhibit’s theme is “Fur, Feathers, and Fins–Our Faithful Pets”. It will run from October 7 through January 29. Having recently come off a weekend devoted to abstracting the landscape (see previous post), during which we painted from photograph, imagination, memory, music and purely abstract concepts, I resolved to apply my newly acquired abstracting skills to actual landscapes. No, more correctly expressed: I resolved to TRY to apply those abstracting skills to actual landscapes. I knew it wasn’t going to be easy. The spread of nature’s delights is so seductive that it is almost impossible to reduce a painting to a few good non abstract ideas. 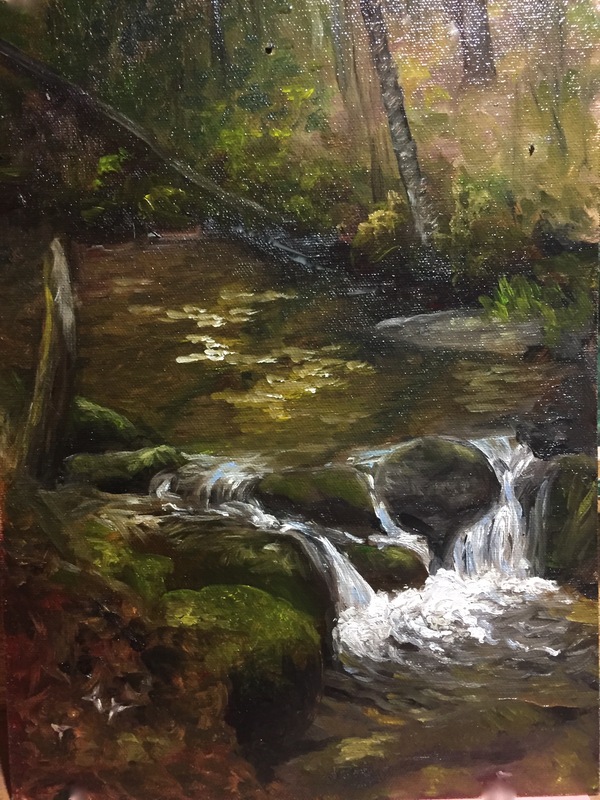 The photo on the left is the result of my painting for two hours at Upper Ammonoosuk Falls, getting sucked into the whole nature thing, trying to capture all the rocks and water rivulets. Fighting with myself. Until finally I heard myself remarking to another artist, by the way of encouragement, that depicting falls, boulders, etc. was hard because of the clutter. Clutter. Such an important non abstract concept. I went back to my painting and swept the water down over all my clutter. And it worked. So what if the scene never looked quite like that! But did I really abstract my landscape? I did a better job than usual in reducing details. It’s a start. Maybe I’ll do better on the next one? The next one turned out to be a panorama of intensely green fields dotted with intensely yellow dandelions, backed by periwinkle mountains, covered by gray clouds threatening rain. Because of the high chance of rain, we had driven south to Conway, where there is a bridge overpass that could provide us shelter from the rain while giving us a river’s edge view of an old-fashioned covered bridge. But we each of us got sucked in by the dandelions, and set about creating rain shelters within which to paint. I was riding with Sharon, so we had to find two ways to create painting studios out of one SUV. She had the tailgate. She also had the bright idea of creating a shelter for me out of my big yellow poncho and the two doors of her vehicle. Here’s a photo of me getting set up under my yellow tent. The tent cast such a strong yellow light over my painting (but not my palette), that I thought I was losing my mind when every time I scooped up a big blob of white paint to use in the sky, it turned yellow as soon as it hit the sky. The yellow tent had to have affected the rest of my painting as well, but it was only obvious in the sky. As a result, I had not much of a good idea of how my painting was coming along. This is not a good situation to be in, for a painter. However, I was trying to be abstract, so maybe, I thought, hue doesn’t matter. I blocked in the elements I wanted: the intense green pasture, the intense yellow dandelions, the intense blue mountains. Added a few tree and shrub features. Still a result not so abstract, but the important thing was, I was thinking abstractly. The one on the left is the painting as it was on Friday afternoon; the one on the right received some help today. It needed more yellow in the dandelions since it no longer had the benefit of a yellow poncho glowing all over it. I cleaned up the sky a bit. The photos do not do justice to the yellows and greens. Oh, well. Just keep in mind ALWAYS–the original looks so much better than the photo. For my third painting, I was fortunate to be able to pick the group’s subject of the morning, and paintings always go better when one is inspired by the subject. There is a railroad that goes from North Conway north through Crawford Notch to a station near the base of the Cog Railway that climbs Mt. Washington. To get through the Notch, the train must travel on rails cut into the granite sides of the pass, and in this particular place, also bridge a gap in the rock face. Especially with the morning light casting a shadow of the rails onto the granite, the tracks create a pattern both arresting and intriguing. On the left side is what I got done on site. We were painting from a parking lot surrounded by growing things in various stages of greening (the trees budded out almost before our eyes–not just overnight but over lunch), so my view of the area below the trestle was obscured. I had installed rough representations of that obscuring growth, but I was bothered by the fact that you could not tell how far away the trestle was, nor how high it sat on the side of the granite face. So I scrubbed the growing things and tried to transform them into rock face. At home, today, I tried to improve on that aspect, as well as the rock formations above the trestle. I’m not convinced that my changes improved the perspective. For our last outing, we chose a spot not far from our home base (the Bartlett Inn). As before, I resolved to think abstractly, just capture the shapes and colors that represented the site. The color for this one was blue. Intensely blue sky, intensely blue water reflecting the sky. A nice snaky curve in the waterway, good aerial effects for the more distant mountains. Simple elements that I should be able to use for an abstract landscape. Alas, the landscape had other ideas. As an abstracted landscape, a pretty miserable failure. But more than passable as a normal plein air landscape, so I forgive myself. The changes I made this morning to the earlier version on the left were mostly in the light greens and the sandy shores. I don’t understand why the blue of the water looks so different now. I think there might have been too much contrast in the first photo. You can tell I have played around with the photo’s color cast, trying to match up with the original painting. The truth of the water lies somewhere between the two versions. My companions for the weekend were my roommate, Betty Brown; chauffeur, Sharon Allen; colleague from Snow Camp, Suzanne Lewis of Rhode Island; young artist Stephen S from Hooksett; new members Leslie and Paul, from Massachusetts, and of course, the esteemed organizer of this semi-annual Getaway Weekend, Byron Carr of Contoocook. Some if not all of these people have websites where their paintings of the same scenes may or may not be posted. If you are a regular reader, you have noticed I am employing a different format for the paired photos. WordPress has added new options, and I am learning how to use them. You can click on the above photos to enlarge them and to read their captions. Do you like this format? At the Bartlett Inn in Bartlett; at the Bernerhof Inn in Glen; at the Red Jacket Inn in North Conway; at the New Hampshire Antique Co-op in Milford; at the Norris Cotton Cancer Center in Manchester, part of the Healing with Art program; and at the law offices of Mesmer and Deleault at 41 Brook St in Manchester. Please save the date of Wednesday, June 22 for a reception at Labelle Winery in Bedford of the Petals 2 Paint show whereat floral designers create live flower arrangements inspired by a painting by participating East Colony artists. This has been an annual event of the East Colony Fine Art artists for many years, but this 2016 show seems likely to be our last as a group. Since the flowers don’t last more than a couple of days, you might as well plan to come for the reception. Last weekend was the annual spring artists’ getaway to the White Mountains of New Hampshire, and I was happily present. This time I took some larger panels to paint on, instead of those 9×12 carton paper supports I have been relying upon lately. I’m a big girl now and I want to paint bigger. I took three 12×16 panels, one 9×12 panel, and as back up if I needed them, a small stack of the carton paper sheets. There were eight of us, not very many but very select. Walt and Ann from western Massachusetts; Suzanne from Rhode Island; Helene, my roommate, from Nashua, NH; Betty from Wolfeborough, NH; and of course the stalwarts and leaders of this plein air event, Sharon Allen and Byron Carr. It was a great weekend, with the weather cooperating for the most part–rare for a New England spring. Weather forecasts for rainy Saturday afternoon sent us off course in search of meaningful nonpainting pursuits, none of which really panned out (the museum in Jackson was closed), whereas the weather stayed lovely and would have been ideal for painting. [virtual teeth gnashing] I made up for it on Sunday and the good thing is, I never had to dip into the reserve supports of carton paper. 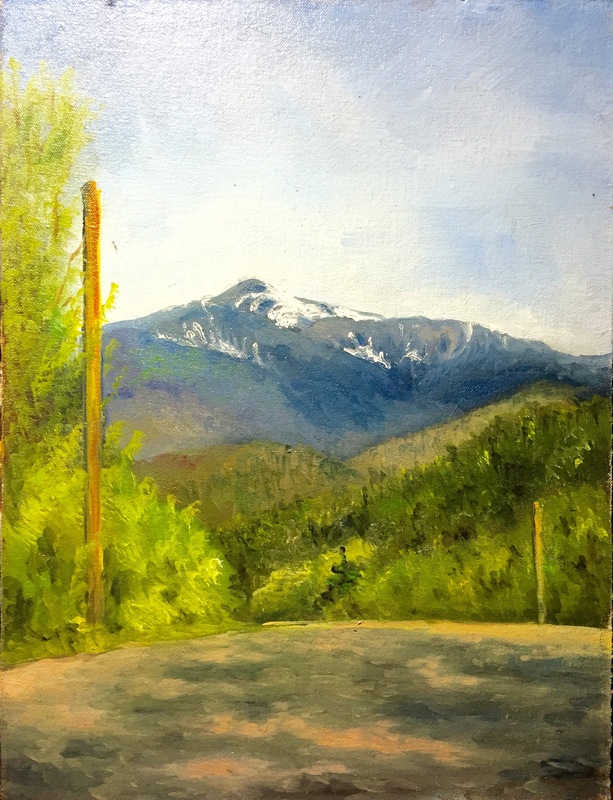 My first painting Friday morning was this one from Pear Mountain Road. View of Mt. Washington from Pear Mt. Rd. After lunch four of us gathered at Jackson Falls. I have painted various versions and aspects of Jackson Falls over the years. How to make this one better? Feature a big rock instead of all that white water. OK, the colors don’t match. For some reason, photographing all of these paintings has been unusually frustrating. The new Photos app that Apple has forced on me does not give me a way to adjust the level of yellows, blues and reds. I am not coping well! That accounts for my three large format, 12×16, panels. Sunday morning, after the usual fabulous breakfast at the Bartlett Inn (but no rancho huervos this year–I forgot to complain about that! ), Sharon and Betty and I followed Byron up a road off Route 3 between Twin Mountain and Franconia Notch:–white water, moss-covered rocks, deep pools. For the best spot, you needed to be pretty adventurous, but I found a tidy little version close to the road and fought off Sharon for it. I included some Trillium at bottom left because I saw some on the slope to adventure spot. This may be my favorite from the weekend. one last week at the East Colony Fine Art Gallery in Manchester (Langer Place, 55 S. Commercial St., Manchester, NH); at the Bartlett Inn in Bartlett; at the Bernerhof Inn in Glen; at the Red Jacket Inn in North Conway; at the Library Arts Center in Newport, NH; at the Sharon Arts Center in Peterborough, NH; at the Buttonwoods Museum in Haverhill, MA; and at the law offices of Mesmer and Deleault at 41 Brook St in Manchester. Maybe it’s time to focus on the good stuff that has happened. Thinking . . . Well, I got into a regional juried exhibit at the Center for the Arts (CFA) in New London. To be more accurate, one of my paintings got into the exhibit (as an exhibitionist, I was always a nonstarter). The chosen painting is “Enchanted”, a 4-foot tall gallery-wrap. [You can see it on my page titled “Studio Landscapes.] I painted Enchanted quite a while ago, and it has hung at Hatfields, and at Kimball Jenkins, then briefly at East Colony, where I noticed how warped it had become. I knew I had to do something to correct that issue before taking it up to New London, so I decided to mount it on a larger, stiff board, like plywood. But plywood that large would be quite heavy. So I am using instead a large piece of foam insulation board, which I painted dark brown. The board, for all its stiffness and success in correcting the warp, is kind of a fragile surface. That’s worrisome, and I am now debating whether to glue on some thin slats as to mimic a frame, which would protect the edges. Such a project it has become! The reception for the CFA exhibit is this coming Friday, November 7, 5-7 p.m. at the New London Inn, 353 Main Street, New London, NH. Unfortunately, there’s little chance I will get there. That Friday is one of my Boston Symphony Orchestra Fridays, and we rarely get back to Manchester before six p.m., and New London is another 45 minutes North. But if you are in the vicinity of New London next Friday night, do check it out and let me know what I missed. Another upcoming date to be hyper-aware of: Saturday and Sunday, November 8 and 9, are NH Open Doors. My personal studio is not participating, but I will be at East Colony Fine Art Gallery on Sunday, demonstrating my painting. The hours for East Colony are 10 to 4, both Saturday and Sunday. The address is 55 South Commercial Street, Manchester NH. Although it looks as if I had more time with Nancy, and therefore she must be on a smaller canvas, both paintings are on 12×16 panels. I was forced to paint in a background around Nancy because I was painting over an earlier painting, and I hadn’t covered it up with a neutral ground the way I had done for the Margaret panel. When forced, I can stretch. But the Margaret was a struggle, and I wasn’t sure I wanted to show it on the blog. It does look better “in person”. (Note to self, must come up with better term to express personhood of a painting.) But today I couldn’t resist juxtaposing the two poses and their stripes. Here is a Mark Your Calendar alert: The NH Institute of Art is holding “Art and Soul“, its 4th Annual Auction in Portsmouth this year. Thursday, November 13, 6-8:30, at Discover Portsmouth, 10 Middle Street, Portsmouth, NH. I have donated my Lotus Studies to the cause (see it on Studio Landscapes page), and the family of my recently deceased friend and law partner, Hilda Fleisher, has donated something from her large collection of contemporary NH art. I can’t wait to see what it is, out of all the pieces with which I became familiar during her life. This event is always fun, with great music and food, and artwork. Tickets cost $45–worth it!–and all proceeds go to fund student scholarships. at the Hatfield Gallery and the East Colony Fine Art Gallery in Manchester (both are in Langer Place, 55 S. Commercial St., Manchester, NH); at the Bartlett Inn in Bartlett and the Bernerhof Inn in Glen; at the Red Jacket Inn in North Conway; at the law offices of Mesmer and Deleault at 41 Brook St in Manchester; at the Manchester office of Congresswoman Carol Shea Porter; at the Norris Cotton Cancer Center in Manchester (but access is limited to patients and health care workers). Two Lowell Cemetery paintings are on view at the Arts League of Lowell, 307 Market Street, Lowell, Massachusetts. In a few days, Enchanted can be see at the New London Inn (address above). And in Portsmouth’s Levy Gallery, you can find 8 of my newest 6×6’s as part of the annual Women’s Caucus for Art 6×6 show. You may also view paintings with prices and order prints at my Fine Art America page. If the painting you are interested in is not there, or if you prefer to bypass that experience, you may contact me by email to alotter@mac.com. Last weekend was the annual Fall Artists’ Getaway Weekend to the White Mountains, based at the Bartlett Inn in Bartlett, New Hampshire. We had some rain, but we also had some glorious, warm sunshine. If only the wind hadn’t accompanied the sun, we would have had little to complain about. As it was, Byron Carr flourished, creating one of his most spectacular paintings (and that’s saying a lot) under threat of rain. Unfortunately, and as usual, taking a photo of it never occurred to me when it counted. So you’ll just have to take my word for it. I have my own version of a cloud painting. This was my first painting of the weekend, Friday morning’s painting. It was actually raining when we set up. Umbrellas intended for use against the sun turn out to serve also against the rain. Who knew? Gradually the clouds rolled away leaving the Ledge exposed, but I stayed with my initial impression, with the Ledge almost totally obscured. The green patch is surrounded by pumpkins but appears itself to have been freshly sowed in something growing bright green–a cover crop perhaps. The intense green is unusual at this time of year, but trust me, I even downplayed it a little. Although I had driven up to Bartlett the day before, Thursday had been a solid, hard rain day. I left Manchester kind of late (around two o’clock) and arrived at Bear Notch Road about four o’clock, in no hurry, enjoying the views without any urgency to paint them. Bear Notch Road connects the Kancamangus Highway (a famed scenic highway) to Route 302 at the center of Bartlett–a great shortcut through the hills and woods. Bear Notch is a two-lane road with overhanging trees. The trees were still in full leaf, orange, red, and yellow. The rain was unrelenting. I felt as if I were floating through an orange cocoon, what with the rain slick on the road reflecting back at me all the oranges, red, and yellows of the trees. I studied the effect as best I could, trying to memorize the elements. But I didn’t stop to photograph it. Story of my life, right? (Well, it was raining pretty hard.) So, to get to the point of Bear Notch Road description, when I finished the Pumpkin Patch before my companions were ready to move on, I started a painting of my memory of the orange cocoon. I continued to refine and improve on it over the weekend, and again today. I added the white line, although Bear Notch has none, in order to facilitate identification of the ribbon as a road, not a river. My problem then was getting across the idea that what you are seeing on the road is water reflecting trees, not just fallen leaves. Only you can tell me if I succeeded. Friday afternoon we relocated to Jackson, all the way around to the other side of what I think of as the Mount Washington wilderness. There are the two routes leading northward out of North Conway: 302 runs to the west of Mt. Washington, and 16 to the right. Eventually, each route gives access to Mt. Washington. The western route offers the Cog Railway. The eastern route has the Auto Road. All weekend we got no farther North than Bartlett on the West and Jackson on the East. This was kind of strange, but the weather did limit our painting time somewhat, so we tended to stick closer to home base. In Jackson, the Jackson Falls are always a big draw for artists. But we had another motive: reception at five in the Jackson Historical Museum, for exhibit opening and sale of White Mountain paintings, both old and contemporary. Yes, there were many Champneys for sale. Here is proof. Upstairs in the Museum are paintings from its permanent collection, grouped by the area of the Whites being depicted. In the center of this room is a topographical map with the locations identified. A treasure. Downstairs I discovered that I really like the works of Edward Hill, but could not afford to buy any. Upstairs, I discovered I really like William Henry Hilliard, especially this work of his called Eagle Cliff. I have my own version of Eagle Cliff from Profile Lake, which I call “Profile Lake”, the cliff being not a prominent feature in my painting. See it here. The food at the reception was outstanding, by the way. Ah yes, my Jackson painting. Sharon and I set up in the parking lot of the Museum, in part because there were good views of the town center and of the river that flows down from the Falls, and in part because we’d be on the spot, parked and ready for the reception at five o’clock. 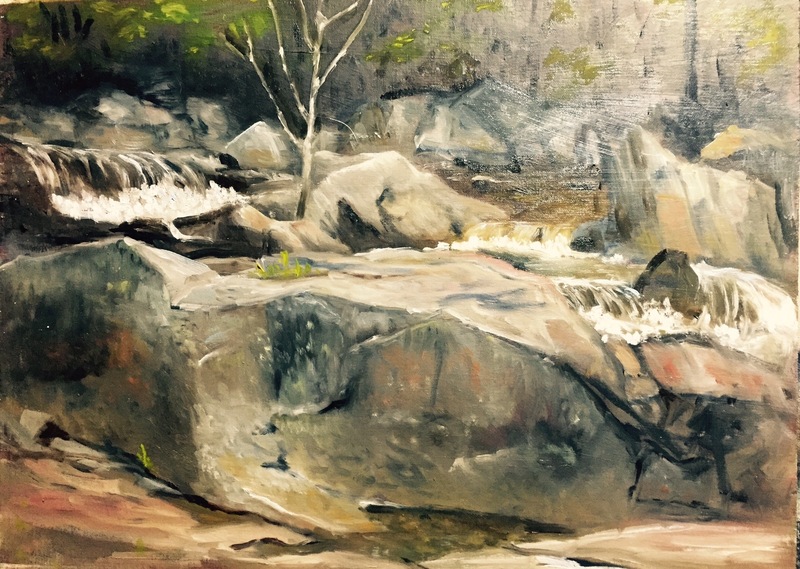 I chose to paint a small section of the river where artfully arranged boulders create happy little rapids. This is actually a cropped photo. I will be cutting the painting down as cropped, which I can do because it was painted on paper. Guerrilla Painter “carton” paper. The top part of the painting is distracting and irrelevant, and I shouldn’t have wasted my time or paint on it. Saturday we revisited May Kelly’s. My idea. Last Spring we painted in the back of May Kelly’s, an Irish pub-type restaurant. My painting was of the back of May Kelly’s. See it here. Around me, other artists had been painting a terrific view of the valley with the Saco River with White Horse Ledge looming over all. Shortly after I got home in May and photographed my painting, the May Kelly painting went missing, never to turn up again. Perhaps one disadvantage to painting on paper. Anyway, having lost the earlier version, I was eager to paint another version of the back of May Kelly’s. As before, other artists’ attention was focused on the valley view. We got rained out, and headed indoors for lunch and reconnoitering. Terrific lunch! By the time we finished eating, the rain had let up a little, but instead of finding a new location, we went back to the Inn and worked on our unfinished paintings. I had taken a reference photo of the back of May Kelly’s just before the rain hit (finally, I remembered to take a picture), so I was able to finish that painting using the photo. In fact, the photo was enormously helpful because it revealed to me how wrong one of my angles was. After finishing May Kelly, I worked on Orange Cocoon some more, getting advice from anybody who was willing to give it, about how best to convey the rain reflections. Saturday night, per our tradition, we got pizza in for supper and reviewed all the paintings that we had created over the weekend. Byron as usual and as appropriate (he organizes the weekend) had the most, and one of the best. Byron Carr. Link here to his website. Other great artists participating: Elaine Farmer from Amherst, Sharon Allen from Derry, Bruce Jones from Exeter, Diane Dubreuil from Connecticut, Penny (sorry, can’t remember her last name) from Maine, and Phil Bean from Milford. Sunday I meandered my way home, looking for a spot that needed painting. I didn’t find it where I expected to, along Route 153 through Eaton and Purity Springs. But on a whim I left the main road (I think I was on Route 28 at this point) to explore up a hill to a place called Moultonville, and happened on just the right spot: an eye-catching scene accompanied by place to park and another place to paint, all without risk to life, limb or property. According to one of the interested residents who stopped to engage me in conversation, the subject of my painting is owned by an artist, last name unknown. So another productive weekend in the company of some of my favorite people comes to a close. You can’t ask for better. at the Hatfield Gallery and the East Colony Fine Art Gallery in Manchester (both are in Langer Place, 55 S. Commercial St., Manchester, NH); at the Bartlett Inn in Bartlett and the Bernerhof Inn in Glen; at the Red Jacket Inn in North Conway; at the law offices of Mesmer and Deleault at 41 Brook St in Manchester; at the Manchester office of Congresswoman Carol Shea Porter; at the Norris Cotton Cancer Center in Manchester (but access is limited to patients and health care workers). One painting is hanging this last week in the Boston Arboretum visitor center. My two cemetery paintings (seen here) are on view at the Arts League of Lowell, 307 Market Street, Lowell, Massachusetts. And in Portsmouth’s Levy Gallery, you can find 8 of my newest 6×6’s as part of the annual Women’s Caucus for Art 6×6 show. If you want to add a public comment to this blog, go to the bottom of this page where it says “Leave a Reply“, and enter your comment in that box. I love to get public comments, so don’t be shy! What a glorious weekend it was! We (Sharon Allen and I) took the scenic route to Bradford, Vermont, to stay with Nancy Griswold, an artist who recently relocated to Vermont after living in New Hampshire and Connecticut. She didn’t know me at all, and had met Sharon only once before, yet opened up her newly restored farmhouse to us as an “artist retreat.” Women artists’ retreat. I can’t say enough about the classy accommodations and the welcome she gave us. I hadn’t painted in Vermont since July 2008, when I took a workshop with Albert Handell in Putney. I was so new to painting then, so green. It has been a long journey in only six years. Nancy has had a longer (lifetime?) career as an artist, but hadn’t been out painting en plein air, or even in her studio, for many months due to the press of other urgencies. Sharon, of course, is also known as Plein Air Gal, and runs our NH Plein air group, and shows up at practically every outdoor event on our calendar. Fall foliage had arrived in Vermont seemingly just in time to meet us there. Color blazed up in vivid patches against backdrops of shifting shades of green: a crazy quilt of purples, roses, vermillions, reds, oranges, ochres, lemon yellow, yellow green, emerald green, sap green, with stitches provided by white birches–not better than New Hampshire’s foliage feast, but earlier. Whereas New Hampshire scenic views tend to be mountain- and waterfall- focussed, the Vermont locations relate to farms. Though separated only by the Connecticut River, the two states are surprisingly unlike each other. And not even that separated either. Bridges between the two were plentiful–seemingly more plentiful than the bridges New Hampshire erects over, say, the Merrimack River. (Manchester is divided between the East side of the Merrimack and the West side, with only three bridges to connect the two.) Vermont has no city of comparable size on the Connecticut River, but it seems as if every little Vermont town has a road to New Hampshire. Robert is restoring the farmhouse and barn and outbuildings on a large, hilly stretch of land overlooking his neighbor’s pond and green grass. I chose for my first painting that pond, viewed from the road. For my second painting, I went back up the hill to capture one of the outbuildings and the “driveway”. A truly bucolic version of a driveway. Sharon chose it for her second painting too. For better views of the paintings, look for them on my “New England Landscapes en Plein Air”. 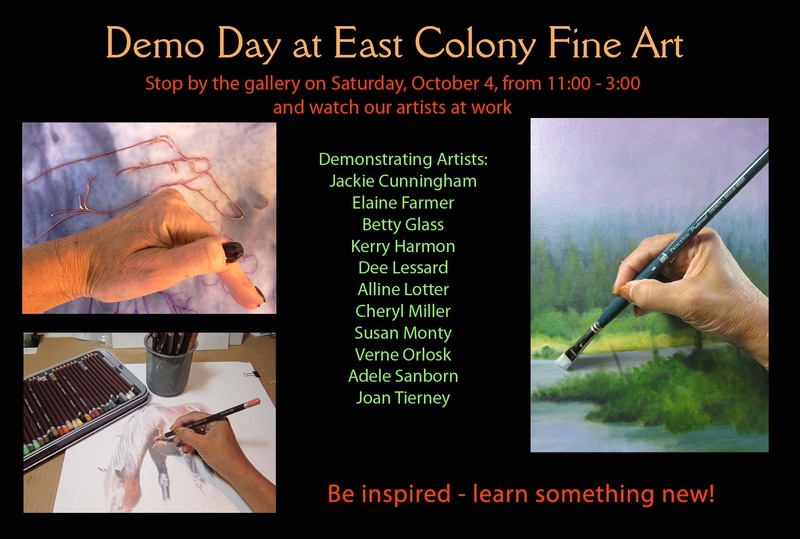 This Saturday I will be demonstrating how I paint as part of the East Colony Fine Art “Demo Day”. Eleven of our artists have agreed to show how they do what they do. Here is a copy of the postcard we are sending out to advertise the event. at the Hatfield Gallery and the East Colony Fine Art Gallery in Manchester (both are in Langer Place, 55 S. Commercial St., Manchester, NH); at the Bartlett Inn in Bartlett and the Bernerhof Inn in Glen; at the Red Jacket Inn in North Conway; at the law offices of Mesmer and Deleault at 41 Brook St in Manchester; at the Manchester office of Congresswoman Carol Shea Porter; at the Norris Cotton Cancer Center in Manchester (but access is limited to patients and health care workers); and at her studio by appointment (email: alotter@mac.com). One painting is still hanging in the Boston Arboretum visitor center. And in Portsmouth’s Levy Gallery, you can find 8 of my newest 6×6’s as part of the annual Women’s Caucus for Art 6×6 show. You may also view paintings with prices and order prints at my Fine Art America page. If the painting you are interested in is not there, or if you prefer to bypass that experience, you may contact me using the private feedback form below. As promised, I have returned from our semiannual getaway to Mount Washington Valley with landscapes of the North Country. Despite still feeling out of sorts, I pulled myself together enough to produce five small paintings. I felt inadequate, so I took only 8×10 panels and a packet of 9×12 carton papers. This morning I took the photographs, and I guess they aren’t so bad. All were dry, already! I use a lot of Michael Harding paints, which are slower drying than some for some artists, but for me, they dry fast. Starting from the beginning, Friday morning, we gathered at “Fourth Iron”, a railroad bridge over the Saco River, near the highway (Route 302), with a parking lot made to order for painters and fishermen. We had four new painters with us: Bea Bearden, Kitty Clark, Jeri Bothamley, and Michele Fennel. The “seasoned” painters were Byron Carr (the organizer of the weekend), Sharon Allen (the keeper of NHPleinAir artists), and Jim O’Donnell. We were later joined by Morgan, a regular whose last name has not made it into my memory bank, and newbie Ruth Sears and her guy friend Joe. Add to that mix the innkeepers Miriam and Nick Jacques, and you’ve got quite a lively group, ready to paint and party. After lunch, we headed south to North Conway, to an area called Flat Rocks Conservation area, and found a spot on the shoulder of the road where we had nice, unobstructed views of the rocky stream flowing by. We were interrupted by a serious rainstorm, so I never “finished” the painting. After coming in for the evening, it is our custom to take in what we have been working on and lean them against whatever we can find back at the Inn, mantels, window sills, floors. Luckily, the dog Noodles pays no attention to the wet paintings (mostly oils, a few watercolors) on the floor, and he is not a shedder (“cockapoo”–I painted his portrait as a puppy years ago). A few artists told me they liked my “stone bridge”. They were not, I later learned, referring to the iron bridge built on the stony embankment. So a lousy rendition of a big rock is now officially transformed into the shadowed tunnel under an imaginary but charming stone bridge. Saturday, Sharon and I went exploring for potential new painting spots in the valley. We stopped at two farmhouses to interview the farmers (of alpacas and strawberries, respectively) about a mysterious road that showed up on Sharon’s GPS. When that investigation bore no fruit, we returned to North Conway to paint behind the restaurant where we ate Thursday night. Mary, the proprietress had told us we were welcome to paint there anytime, and it was a fantastic view across the valley with the Saco River cutting through. I, however, turned my back on that view and took on the fantastical restaurant itself. Ambitious. Mary brought us coffee and two huge slices of gluten-free chocolate cake, so that was lunch and so much for sticking to my diet. We finished up about two thirty and went back to the Inn (Bartlett Inn). A very tall, very old white birch was still standing on the grounds in front of the cabins, and it was slated for removal, so Sharon and I each painted a portrait of it, dead but still beautiful. That evening, as is our custom, all of the artworks were produced for comment. This is when I learned of the Stone Bridge. When asked which of my paintings was my favorite, I said the birch. Either the company disagreed with me, or they were anxious to help me make it better–whatever, it elicited several points of criticism: the foreground rock was too prominent and should probably be removed totally; the background green was . . . too strong? ; the tree on the left was too distracting–it should be de-emphasized by bringing in branches crossing in front, or perhaps (my own suggestion) soften its edges (that is magenta on its right edge!). What do you think? Sundays we usually pack up, check out of the Inn, and look for one last painting location before wending our ways home. Thanks to Sharon the explorer, this year we collected near a marshy area south of Conway, at Dollof Pond, with a view of Mount Washington. I looked it up on Google maps and found another pond nearby that I wish we could paint just for its name: Pea Porridge Pond. Oh, well, cheating not allowed. Thus ended the tenth annual Spring Getaway. I felt strangely unfulfilled. The next morning, Monday Life Group got me out of bed and into the studio. I brought a used panel, not even sanded down, not even toned over. To reduce distractions from the old painting, I applied a layer of burnt sienna, then added Gamblin’s Fast Matte ultramarine blue. Of course, these underlayers would not dry in time for me to paint over them, so I was asking for trouble, double trouble. The photo below isn’t good either, because light catches the wet paint on all those little protrusions. I dialed the exposure down to minimize the light bumps for you. Something about this painting really appeals to me. The flesh may be a little “muddy” but color is all relative anyway, so I’m not bothered by that. What thrills me is that her right leg looks so real, so fleshy! Her face isn’t bad either. If only I had just a little more time to bring all of it up to that level of accomplishment. Now I am moving into Panic Mode over the imminence of my Featured Artist stint at East Colony. I have to “hang” this coming Saturday!! OMG. But then it will be done and all I have to do is enjoy. I am paired with Larry Donovan, an artist whose works I noticed long ago at East Colony, so I feel quite honored to be in this position. Who’d a thunk a few years ago, when I hardly knew what was up? We are looking forward to seeing all our friends and collectors at the reception on Sunday, June 8th, from two to four. He wanted two to five, but I am just not up to three hours on my feet, making nice. I am looking forward to seeing YOU if you are at all able to come, if not to the reception, then at some point between May 24 and June 28. Let me know when you are in town and I will try to be at the Gallery. at the Hatfield Gallery and the East Colony Fine Art Gallery in Manchester (both are in Langer Place, 55 S. Commercial St., Manchester, NH); at the Bartlett Inn and Bernerhof Inn in Bartlett; at the Red Jacket Inn in North Conway; at the law offices of Mesmer and Deleault at 41 Brook St in Manchester; at the Manchester office of Congresswoman Carol Shea Porter; in the lower level of the Bedford Public Library, Bedford, NH; and at her studio by appointment (email: alotter@mac.com). You may also view paintings with prices and order prints at my Fine Art America page. If the painting you are interested in is not there, or if you prefer to bypass that experience, you may contact me using the private feedback form below. If you want to add a public comment to this blog, go to the bottom of this page where it says “Leave a Reply”, and enter your comment in that box. I love to get public comments, so don’t be shy!